I thought it was about time I made another wishlist! I didn’t want to bombard you with the endless list I have of all the beauty products that I need in my life right now, so I narrowed it down to just five, hardest hour of my life haha! Let’s start with the Rimmel London Stay Matte Primer. I’m currently using the Rimmel London Stay Matte Foundation and honestly, it’s a dream come true! It’s lightweight and you really only need a tiny bit for a full even coverage. At the moment i’m not using any primer at all, just moisturiser but I really think that this Rimmel Primer will really add to the matte finish, plus, they claim it minimises the appearance of pores, brilliant! Currently £5.99 at Boots. If you haven’t heard, the one and only Miss Tanya Burr has brought out her very own beauty range, Tanya Burr’s Lips and Nails, you can check out the whole collection here. The lip gloss that I’ve got my eye on is “Vampire Kiss,” I just love how vibrant the colour is and I actually don’t own a red gloss! I’ve read about 200 reviews on Benefit’s They’re Real Mascara and everyone has something great to say about it. One of my friends Kim, was telling me that she only needs to apply one coat of this magical mascara and she’s ready. The only issue I have with this mascara is the price, I just think that £20 is a lot of money to spend on a single tube of mascara. I’m venturing off to the UK next week and seeing as i’ll technically be on holiday, I might just treat myself. This season it seems to be all about pastel’s and I adore pastel nail colours! I probably don’t really need to invest in any more nail polish’s but look how sweet this Essie one is! Mint Candy Apple, even the name is cute! Last but certainly not least is this shamazing eye shadow palette. It is of course the ‘The NARSissist’ Eye Palette by Nars and boy am I in love! The palette brings 15 shades from matte caramel to matte black. Coming in at £49.97, a little steep maybe, but don’t forget you’re getting 15 different shades, imagine all the different looks you can achieve with this palette, i’m getting excited just thinking about it! 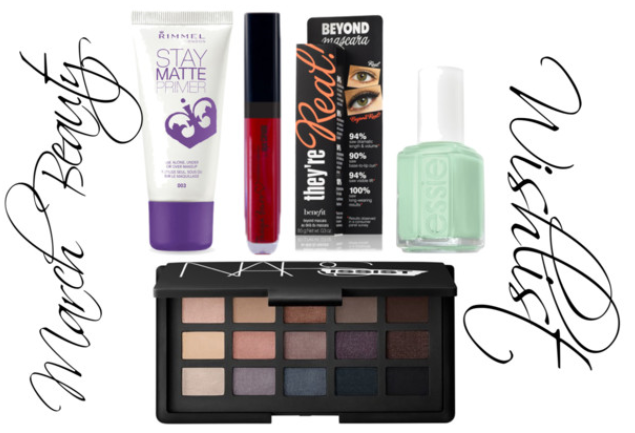 So, are any of these beauties on your beauty wish list this month? What are you lusting over? Let me know!